What is Personal Genomics Test? Personal Genomics test is the most advanced, one-time test for healthy individuals to detect health risks and enable personalized preventive measures. Diseases including cancer, heart conditions, diabetes, brain disorders etc. have a genetic component-that means it’s in your DNA. By analyzing your DNA, the Personal Genomics Test detects genetic risks of more than 1000 diseases including cancer, heart disease, neurological conditions, diabetes, etc. This test is commonly used in leading institutions like Mayo Clinic, John's Hopkins, MD Anderson Cancer institute etc. and is increasingly becoming a norm in the western world. Kokilaben Dhirubhai Ambani Hospital is the first hospital in Mumbai to provide this personal genomics test. 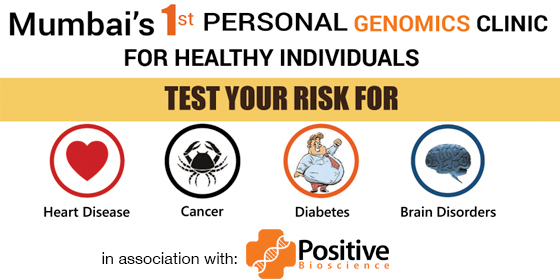 The personal genomics test can help you prevent risk to 1000+ diseases by identifying genes driving diseases like cancer, heart disease, diabetes, Alzheimer's, multiple sclerosis, schizophrenia and many more. Prevent diseases: As the saying goes “Prevention is better than cure” the test helps you to prevent diseases from occurring at the first place thus saving you from lot of discomfort physically, emotionally & financially. E.g. Cancers risks can be reduced by 20 times by taking preventive measures based on genomics test. Early diagnosis: Many diseases are caught at an advanced stage. Personal genomics test help detect diseases early, in most cases before even it manifests. E.g. Lung cancer in India 90% times is caught in stage III or stage IV, Personal Genomics test helps in detecting lung cancer in stage 1 thus increasing survival chances upto 8 times. Delay occurrence of diseases: There are few diseases in which preventive measures are limited, such diseases the occurrence can be delayed. E.g. Alzheimer’s: Occurrence of Alzheimer’s can be delayed by doing activities which activate different parts of brain. Genetic Counselling: Once your reports are ready our genetic counselors will schedule an appointment for genetic counselling to explain the report in detail to you. Genetic counselling normally takes 45 minutes to 1 hour. You have family history of cancer, diabetes, heart attack, Stroke etc.